View from SE. Photosurvey 6-MAY-1993. See also NT27SE 3979, NT27SE 589, NT27SE 2735, NT27SE 4356, NT27SE 4360, NT27SE 4417, NT27SE 4418. This bridge, made of cast iron and straddling the Braid Burn, was constructed, erected and painted in March 1831 by the Shotts Iron Company. It cost £133.10s.0d. There is considerable historical and technological interest in the cast iron beams as they furnish the earliest extant examples in the world of their particular type. 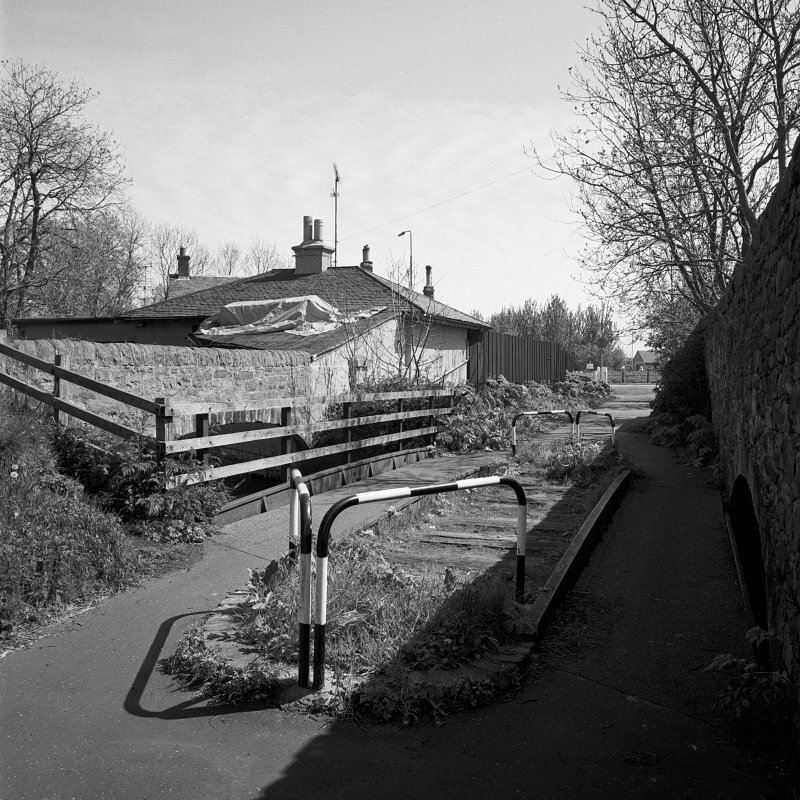 A survey undertaken on 5 and 6 September 1992 by the Scottish Industrial Heritage Society shows that the bridge possesses three major beams and a minor beam on the upstream side. 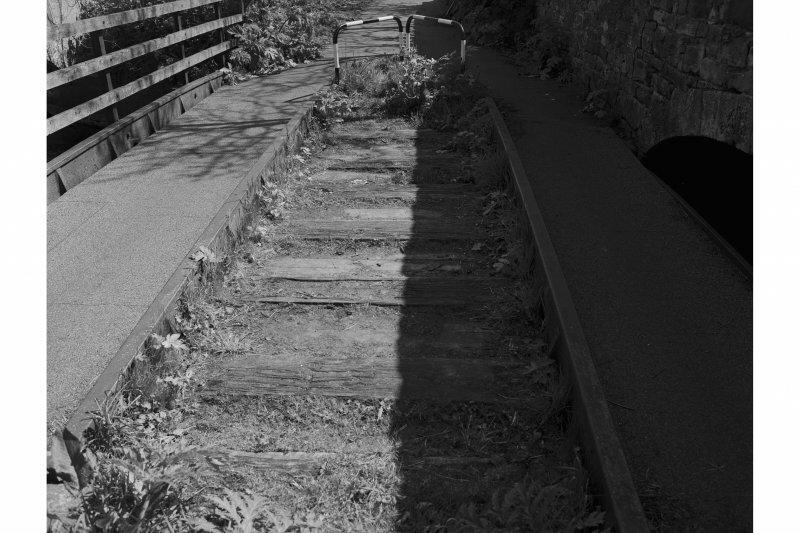 It is probable that the central section of the existing arrangement is made from wooden sleepers belonging to the railway. As regards the outer sections, which are now part of the footpath/cycleway, these may be replacements for a former deck. It would seem from the way the abutments on the downstream side of the bridge are arranged that there was a double track line before 1847. As the lugs for the tie bolts are 'eccentric to each other', it is obvious that the rails have been shifted and re-aligned. The reason for this is probably the guage change and reduction to single track which occurred in 1847. There is only a single track shown crossing the bridge in the 25 inch OS map of 1893 (Edinburghshire sheet III.12). Generally speaking there are uniform sized flanges on the main inverted T-section beams, with the top flange having a longitudinally convex shape. The equi-spaced braces taper from top to bottom, being noticeably wider at the top. It is difficult to measure the overall length of the upstream L-section beam as its ends are embedded in the abutments. However, the exposed section gives a clear picture of an upper edge which is also longitudinally convex, and 'formed by a three-centred arch.' The ends of this L-section beam are probably rounded, whereas the main beams have square ends. This bridge is visible on the 1st edition of the OS 6-inch map (Edinburghshire 1855, sheet 6), on the 2nd edition of the OS 6-inch map (Edinburghshire 1895, sheet ivSW), on the current edition of the OS 1:10000 map (1989) and on the OS Basic Scale digital map (2000). Information from RCAHMS (MD), 19 July 2001. Photographed by RCAHMS during the reinstatement of the bridge in 2001. This bridge is depicted, but not noted, on the current edition of the OS (GIS) AIB. Information from RCAHMS (RJCM), May 2006.
coping stones. Breaks in build at each end of the existing parapet were at one time part of a longer stone boundary wall, depicted on the 1855 1st edition OS map. 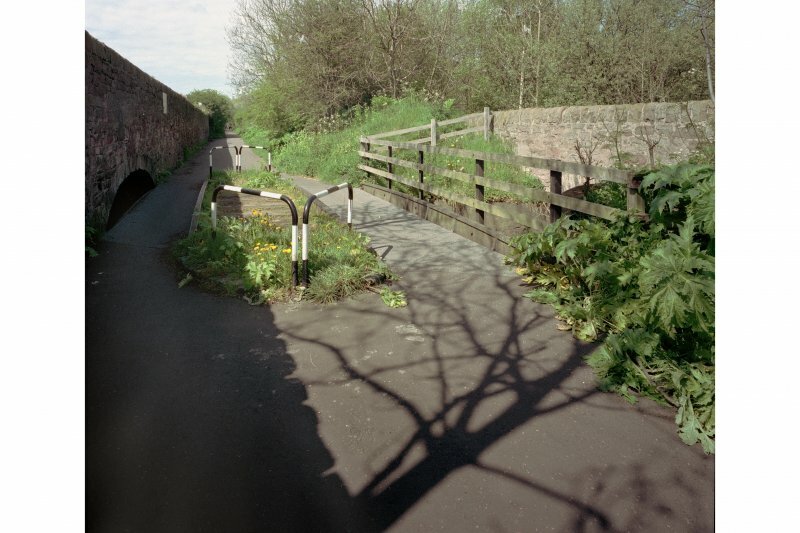 A cast-iron skew bridge which carried the railway over the Braid Burn near Duddingston. It has a span of 1712 ft and was made, erected and painted in March 1831 by the Shotts Iron Company for the sum of £133.50. The bridge originally extended over the double track width of the railway. The cast-iron beams are in two forms, one L-shaped in cross-section and the others of an inverted T-shape resting on cast-iron, ridged, bank seat plates. These beams are of great interest as they are among the earliest surviving examples of their type and they carried railway goods traffic until 1968 when the line was closed. The bridge is now conserved and interpreted by the City of Edinburgh Council as part of a cycle path. In August 2001 the beams were raised to accommodate a greater water depth in the burn. The project was awarded a special commendation by the Institution of Civil Engineers Panel for Historical Engineering Works in recognition of the exceptional care taken during the work in preserving ‘a prime example of one of the world’s earliest surviving cast-iron bridges on a public railway’. Reproduced from 'Civil Engineering heritage: Scotland - Lowlands an Borders' with kind permission of Thomas Telford Publishers.